Best practices can be outdated, harmful, and a hindrance to innovation. Their purpose or effectiveness is rarely questioned. 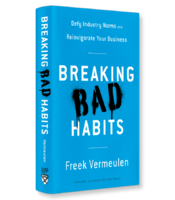 In Breaking Bad Habits, strategist Freek Vermeulen offers the tools to identify these practices and get rid of them. He also shows how eliminating popular but outworn ideas, processes and strategies can create new opportunities for innovation and growth. Breaking Bad Habits will encourage you to reinvigorate your business by breaking out of the status quo. Any change initiative must inevitably confront standard operating practices that have become industry norms. A response of “That’s the way we’ve always done it” to any question about a policy or process indicates that the organization has stopped questioning its norms. In his new book, Breaking Bad Habits: Defy Industry Norms and Reinvigorate Your Business, London Business School Professor Freek Vermeulen takes a closer look at the validation of these standard operating practices. He argues that what many organizations would claim to be best practices are actually nothing more than the habitual ways of doing things that typically deliver suboptimal performance. Vermeulen admits that not all best practices are bad. For example, tracking key performance indicators or utilizing “formalized management techniques” such as Six Sigma have a well-documented history of success. What concerns the author are traits of organizational culture that originate from a Darwinian view of management. He questions the inherent assumption that new practices will overcome and purge old, bad practices based on some misguided notion of survival of the fittest. When we adopt all of the practices of “successful companies” in the belief that they all contribute equally to that success, or we jump on the bandwagon and adopt a best practice just because it has become an industry norm and everybody’s doing it, there is no hard data behind that practice. There’s a big difference between good optics and good business. For example, Vermeulen cites the case of a group of in-vitro fertilization (IVF) clinics in the United Kingdom (UK) that vigorously pursued their respective ranking on a “League Table.” This “government-mandated and publicly-accessible website” included each clinic’s success rate in IVF procedures and was quickly adopted as a de facto scorecard. In its simplest form, the key to eliminating bad practices is a healthy dose of skepticism. Consider the widely accepted practice of benchmarking for new ideas from competitors both inside and outside of your market. Yes, you might find a new idea, but the greater likelihood is that you will simply adopt someone else’s bad habits and allow them to spread and persist. Reverse benchmarking, on the other hand, involves identifying those same best practices but then asking each organization why they follow them. If no one can give you a satisfactory answer, that suggests that the practice is persisting solely on reputation and a lack of investigation. The author cites the example of the Independent newspaper in the U.K., which had traditionally been published in large broadsheet format. The justification for continuing this practice was “That’s the way we’ve always done it.” Financial difficulties prompted a series of cost-cutting reviews, including the decision to publish in magazine format after trials of the smaller format outsold the traditional by three to one. Vermeulen concludes with a stern warning that organizations have entered every aspect of our modern lives to the point where they have become “entities in themselves.” This only serves to facilitate the spread of bad habits. It’s up to the humans in these organizations who “possess the abilities of consciousness and volition” to identify and eliminate those bad habits. Breaking Bad Habits proposes that many widely accepted best practices are really outdated and harmful bad habits that persist solely based on past reputation. With an eclectic range of examples from industries as diverse as hotels, newspapers and IVF clinics, the book offers a set of comprehensive tools for identifying these bad habits and purging them from your organization.